Watch the birds! 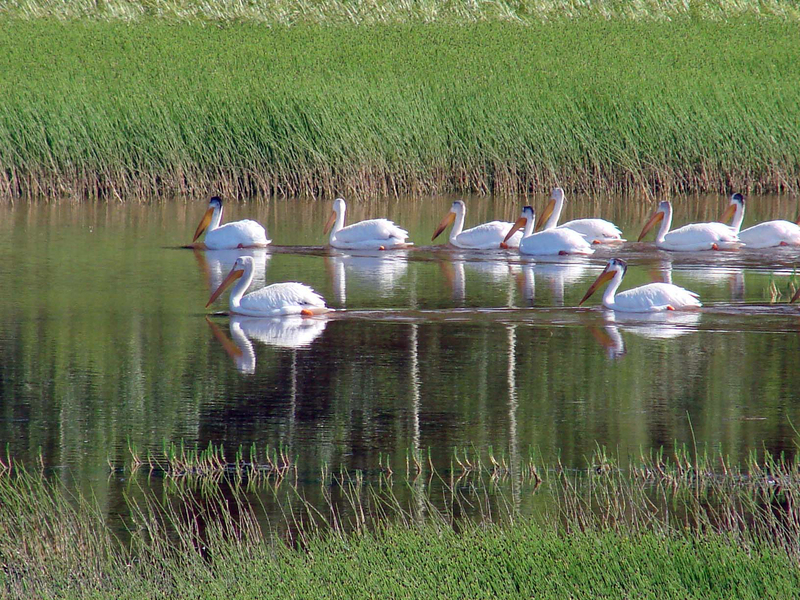 Eagle's Nest is located on a major migration route, and many birdwatchers have called it the highlight of their birdwatching tour. Or you can just relax in our Guest Garden with a drink. Relax at Eagle's Nest and fly to the mountaintops in these one-of-a-kind wilderness experiences! 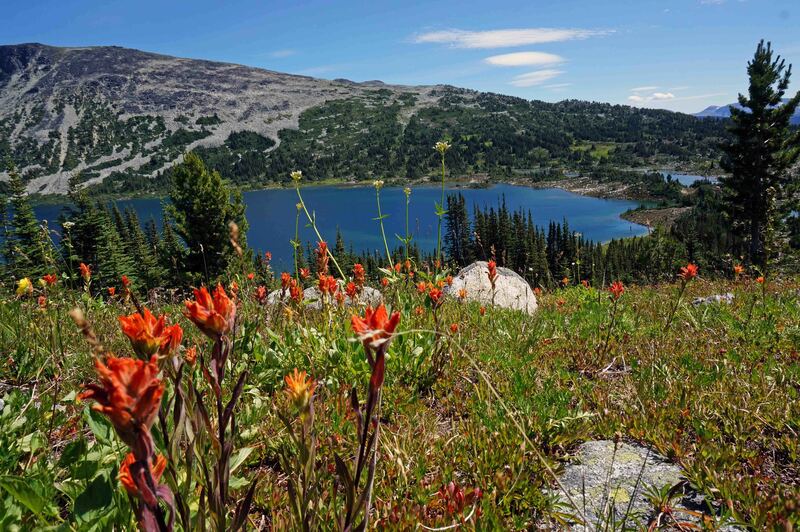 Situated at the top of a huge escarpment, Turner Lake in Tweedsmuir Provincial Park is surrounded by spectacular mountain scenery. 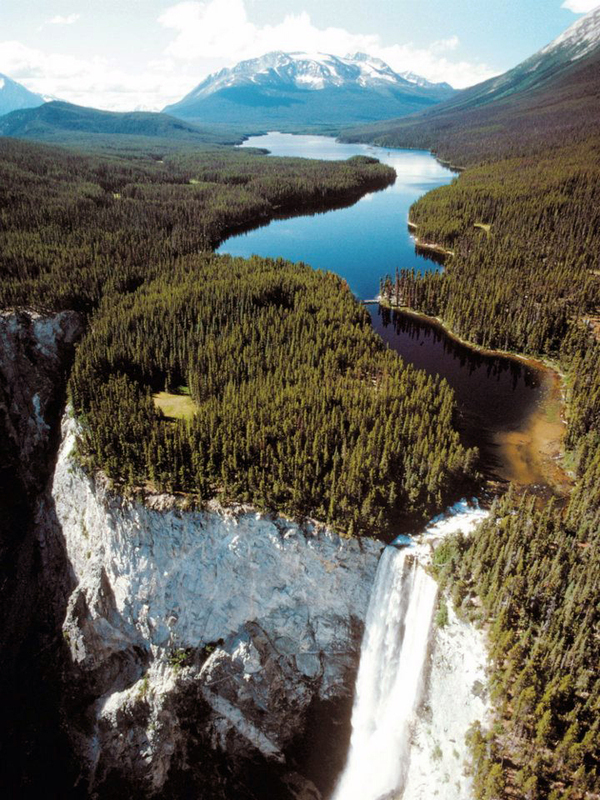 At the end of the lake is Hunlen Falls, the third highest free falling waterfall in Canada, tumbling more than 1,300 feet to Lonesome Lake far below. A "flightseeing" tour gives you an opportunity to view the falls, with the option of landing on Turner Lake to hike to the edge of the falls. Or you can do the hike as a stand-alone fly-in adventure (see pricing below). There are two short hikes that begin where the float-plane drops you off, each providing magnificent views and an opportunity to experience the awesome grandeur of the falls. For an independent travel writer's experience of the falls, click here. At the top of the Pacific Coast Mountain Range, only minutes by air from Eagle's Nest Resort, are the Monarch Icefields. These are the largest icefields in North America outside of the Arctic Circle, and an amazing sight considering that they are so close to the beautiful summer weather you left behind at Anahim Lake. 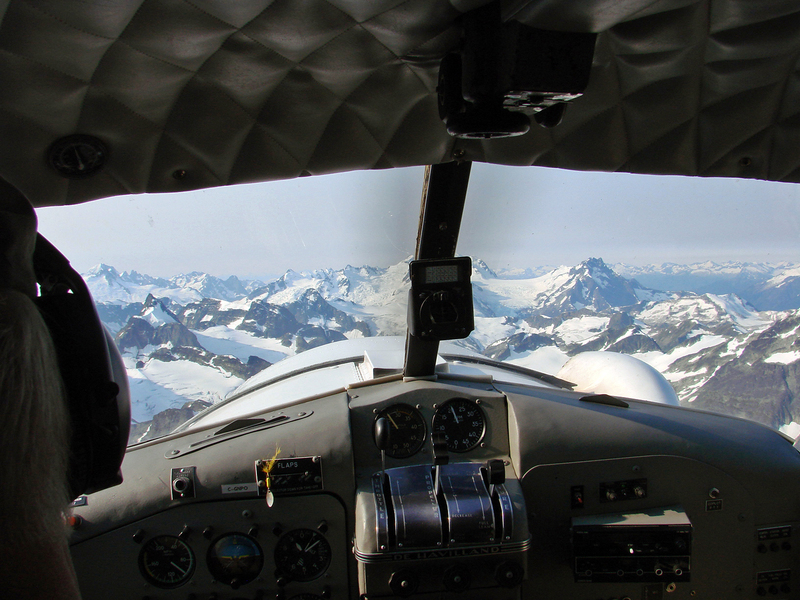 Fly between massive mountain peaks and see rivers of glacier tumble down the mountainside like a giant roadway. It is an experience you won't soon forget. 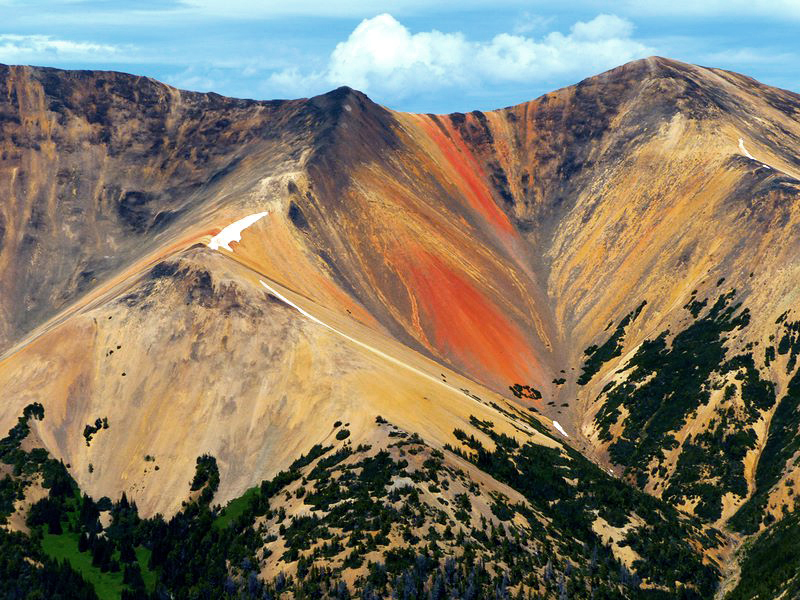 The Rainbows are very old volcanic mountains, very heavily mineralized, and so colourful they were known by the early indiginous people as the Painted Mountains or the "mountains that bleed". The red, orange, yellow and even white rocks form brilliant patterns and slide areas that are truly beautiful as you fly beside them. See this travel writer's description of these amazing mountains. See these sights from the air in a legendary Beaver or classic Cessna floatplane. 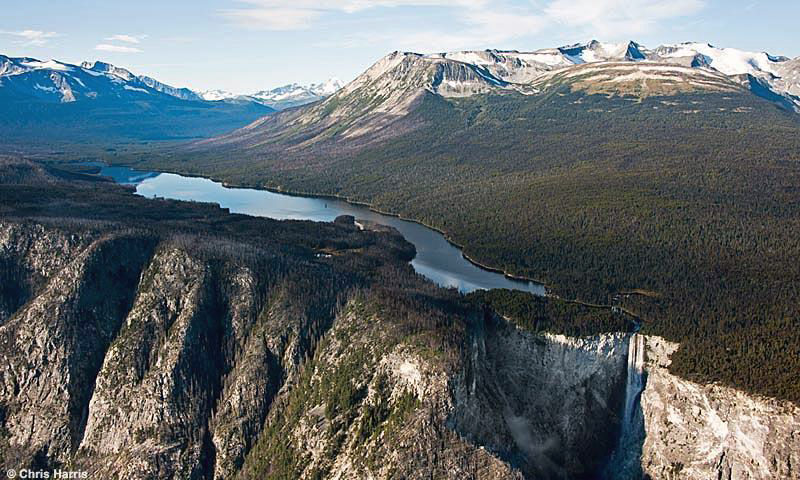 Tours can view any or all of the Rainbow Mountains, Hunlen Falls, and Monarch Ice Fields. This unique experience is not to be missed! Flightseeing Tour: to all three sights is about 1 1/4 hours in length, and costs about $250 per person (4 people sharing), or $300 per person (2 people sharing). Hunlen Falls stopover extra. Custom tours available. Fly-In Hunlen Falls Hike: From $250 per person (2 people sharing). Eagle's Nest can help arrange your tour along with your stay. Just ask us! Hike along the moutaintops in these one-of-a-kind guided adventures! With your experienced guide you will hike through the valleys and alongside alpine lakes at the top of the Coast Mountain Range. 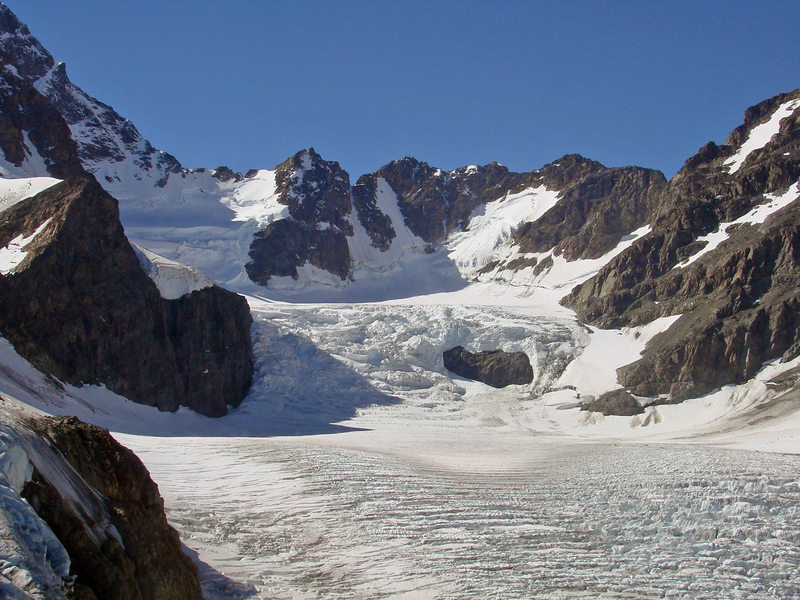 Or fly-in to the edge of a massive glacier for a spectacular glacier hike. For adventurous day-hikers, these experiences are not be be missed! The eastern part of the Chilcotin Plateau is famous for its grasslands, deep canyons, sand dunes, and Bighorn Sheep. It is unlike anything else in the region. 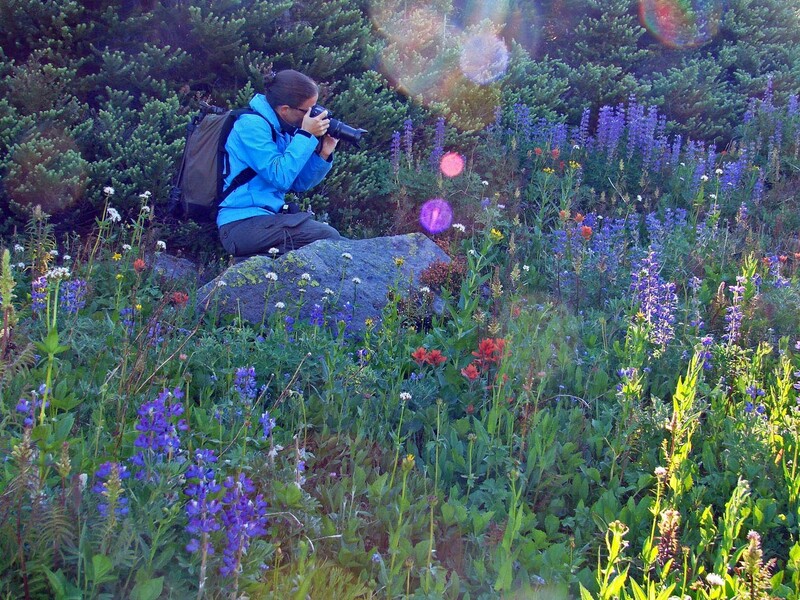 Enjoy this amazing part of the Chilcotin-Coast while staying at the historic Chilcotin Lodge. Your hosts Brenda, Kurt, and Kris will welcome you to this charming and unique frontier hotel - with comfortable rooms and delicious meals. 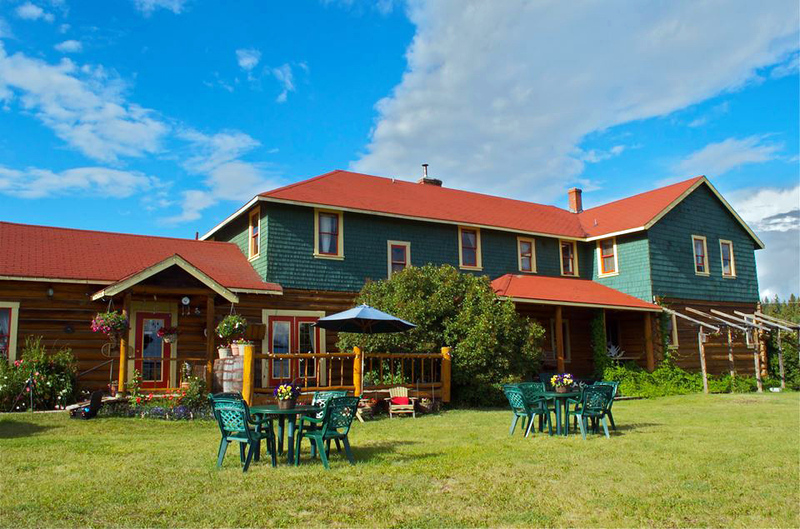 Chilcotin Lodge is located just 1/2 hour outside of Williams Lake along Highway 20 - the perfect spot to begin or end your Chilcotin-Coast holiday! From the lodge you have easy access to Farwell Canyon, with its desert-like atmosphere of sand dunes and hoodoos, with the beautiful Chilcotin River carving a path through the middle of it. Take a river rafting trip if you like! 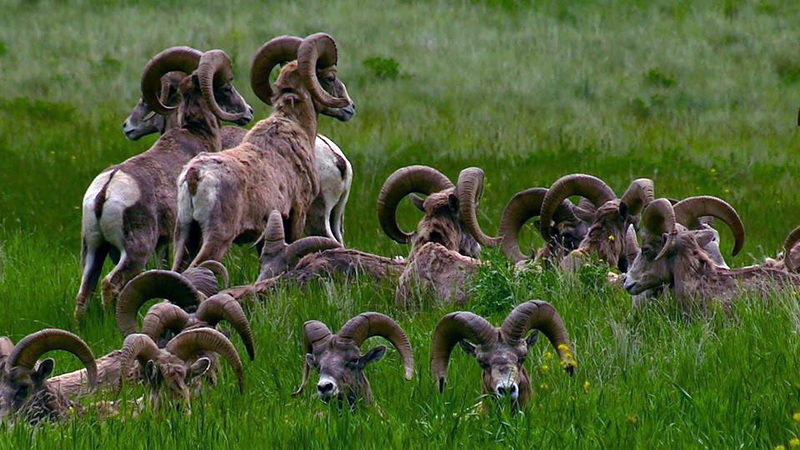 Or wander through beautiful Junction Sheep Range Park, a sculpted landscape of near-extinct desert grasslands and deeply eroded gullies at the junction of the Fraser and Chilclotin Rivers, home to a signicant herd of wild California Bighorn Sheep. 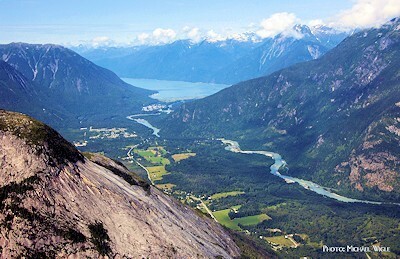 From the Chilcotin Plateau, drop down 5,000 feet to the floor of the Bella Coola Valley! This is the centre of the area now known as the Great Bear Rainforest. Get the most out of your stay with a tour from Bella Coola Grizzly Tours. Your host Leonard Ellis offers modern cabin accommodation and terrific day tours that will make your trip to the Bella Coola Valley a memorable experience. Take a day trip up some of the longest glacial fjords in the world onboard the 42-foot MV Nekhani. This voyage through the middle of the Great Bear Rainforest will visit wilderness hotsprings and First Nations pictrographs, search out some of the abundant wildlife, with a delicious seafood lunch! The spectacular scenery of the Discovery Coast is worth the trip all by itself. 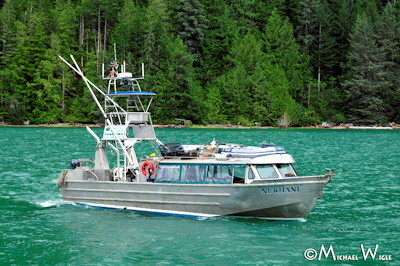 Leonard has been guiding people on these waters for over 30 years, and is a knowledgable and charming host. To make Bella Coola Grizzly Tours part of your vacation, see Chilcotin Coast Experience and let Leonard show you the best of the Bella Coola Valley. For PHOTOGRAPHERS: Develop your creative vision in a 7-day workshop with well-known professional photographers Chris Harris and Dennis Ducklow. Held in Bella Coola June 18-25, 2019 and in Barkerville September 3-10, 2019, Chris and Dennis have been giving this workshop for years to rave reviews from participants. Click here for more information.